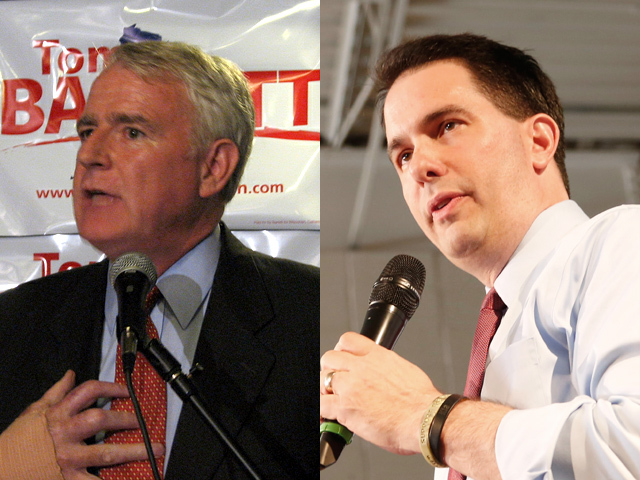 (CBS News) As voters head to the polls Tuesday to decide the fate of Wisconsin Gov. Scott Walker, reports out of the state suggest that robocalls are being placed informing voters, falsely, they don't have to vote if they signed the recall petition. There have also been reports of mailings going out to voters telling them they can't vote unless they did so in 2010, and of people going door-to-door telling voters they don't have to go to the polls if they signed the recall petition, both of which are also untrue. Wisconsin residents are voting today in a closely-watched, high-profile recall election against Walker, the state's Republican governor, who was elected in 2010. He is being challenged by Milwaukee Mayor Tom Barrett, who beat organized labor's preferred candidate to win last month's Democratic primary. Barrett entered the race in late March, but the effort to recall Walker effectively began last February, when the newly-elected governor released a budget plan that proposed elimination of most public employee bargaining rights. Wisconsin recall election: Will Scott Walker survive? According to the Center for Public Integrity, candidates and outside groups have spent a record-breaking $63.5 million on the recall election. Barrett's campaign sent out a fundraising email on Monday alerting supporters to the alleged robocalls. On Tuesday, Barrett press secretary Melanie Conklin said the campaign was "very concerned" about efforts to suppress Democratic turnout. "We are very concerned about voter suppression. We have had many, many reports of this. In Kenosha County, Minority Leader Peter Barca told us someone reported it to his county clerk," Conklin told CBS News. Conklin said the campaign had not yet been able to track down a copy of the recording, but that there were also mailings going out telling voters that unless they voted in 2010 they cannot vote now. In a letter to Kevin Kennedy, the director and general counsel to the Government Accountability Board, Democratic Wisconsin state Senator Lena Taylor requested the board's "immediate action, as in today, to begin investigations and prosecutions into such persons that are committing election fraud and misdemeanor crimes by their individual or group communications." "As has been reported in the media and throughout social networks, there are groups spreading false information about today's recall elections," the letter reads. "Notably, two blatantly false tactics have been employed by groups or individuals that seemingly would support Governor Walker's campaign." "Both of these assertions are blatantly false and constitute the commission of an election-related crime," Taylor wrote. The Walker campaign on Tuesday denied accusations that it was behind any misleading robocalls, although it did not dispute their existence. "Any accusation that our campaign is making those calls is categorically false and unfounded," Walker campaign spokeswoman Ciara Matthews told CBS News. "Once again Mayor Barrett and his campaign are trying to falsely attack Governor Walker with absolutely no evidence. This is a desperate move by Mayor Barrett to avoid addressing his lack of a plan to create jobs in Wisconsin." Reid Magney, a spokesman for the Government Accountability Board, said he had received reports about the calls from both voters and the media but that the board had neither identified the source of the calls, nor the extent to which they are widespread. However, he noted that the board will work with District Attorneys on possible charges if and when it gets information about the source. Magney said that for now, the board is telling voters to be skeptical of any information they receive from robocalls, emails, or people going door-to-door. He noted reports from over the weekend alleging that people were going door-to-door telling voters they didn't have to go to the polls if they signed the petition. The only other voting issues the board has heard about today is a voting machine that was discovered damaged this morning in Marathon County, according to Magney. He said it's possible it was intentionally damaged and it has been turned over to authorities. President Obama's campaign on Tuesday released a get-out-the-vote video on Wednesday, featuring campaign volunteers telling voters "it's absolutely crucial that you come out and help." "We need to get our rights back, we need to get our state back," says Laura H., a volunteer featured in the video. On Tuesday, Mr. Obama took to Twitter to officially endorse Barrett. He wrote: "It's Election Day in Wisconsin tomorrow, and I'm standing by Tom Barrett. He'd make an outstanding governor. -bo." Caroline Horn contributed to this report.